PLEASE NOTE: The date of this get together may change. Please watch this site and/or your email. Time & Location to be announced. We will be in room A129. Don’t enter in the usual door. Come through the door to the far LEFT (North) of our usual entrance. At that north entrance, A 129 with can be reached through the first door on the right. We will be able to pull our cars to the North entrance thru the Staff Parking Lot to the left of our usual entrance. This allows you to bring in several larger plants to use. Please bring seeds and containers for planting, and some to share if extra. This is a good time to take advantage of Deirdre’s knowledge of plant propagation by cuttings, grafting, layering and etc. It will also be helpful to bring the outline from the February meeting. If you would like some extra VMS volunteer time, we will need help setting-up and closing down at this meeting. We expect to be there before 6 p.m., so please feel free to come then or whenever you can come. Thanks! Have you ever had an aching back or sore arms and hands after working in your garden? Want to stop all those painful and nagging aches? Learn about the common ailments that most gardeners suffer and how you can prevent them. Learn how to stay fit and use your gardening tools without discomfort. Bring your own water or coffee cup! Deirdre is an Advanced Master Gardener and the MSU Wayne County Coordinator. She will talk about the why and how of seed starting. This will include a demonstration. 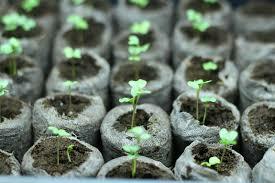 She will also cover propagation of plants. The presentation will include leaf and stem cutting. Come and hear Deirdre tell us all the important details of these topics. There is to be a follow-up on April 7th with a hands on session covering both of these topics. Details to follow. A presentation that examines how our founding fathers were vested in gardening and the significant contributions made by several of them to the landscape of our fledgling country. Virginia is an Advanced Master Gardener. She is a member of the National Garden Clubs and their Gardening Study, Landscape Design and Environmental Studies Consultant. Also a member of the Michigan Garden Club’ and is their Life Membership Chairperson, past 4th Vice President, and District I Director, past president of the Grosse Ile (MI) Garden Club President and the Ikebana International, Detroit Chapter 85. She has presented at “2011 Growing Great Gardens” and “Growing with Master Gardeners Conference” in 2011 and 2014.